Andy Lyons/Getty ImagesBrooks Koepka has won three majors in the past 14 months. Brooks Koepka held off Tiger Woods and Adam Scott to win the 2018 PGA Championship, his third major championship in 14 months, on Sunday. Koepka is from the new school of golfing that believes the best way to win is to hit drives as far as possible and not worry about landing in the rough. While most of the attention at the 2018 PGA Championship was on Tiger Woods, Brooks Koepka was winning the tournament with his latest Woods-like performance. Koepka’s dominance at the majors is reminiscent of a young Woods. He has now won three majors in the past 14 months and has finished 13th or better in 10 of the previous 12. But the similarities go beyond the results. When Woods burst onto the scene in the late 1990s, he wowed the golf world with booming drives that shortened the courses. Now, 20 years later, the next generation of golfers is not only emulating Woods’ formula, but taking it a step further. And it’s led by Koepka. For many in this next generation of golfers, it has gotten to the point where they feel aim off the tee is overrated. “Being in the fairway, I think the fairways are a little bit more overrated,” Koepka told the Golf Channel. Koepka went on to explain that it doesn’t matter where his ball lands since his approach shots to the greens will still be easier than most golfers, even if he is hitting from the rough. Koepka said that with a bit of a “sorry, not sorry” shrug. Koepka has averaged 313 yards off the tee this season, ninth on the PGA Tour. But his accuracy off the tee is among the worst on the tour, hitting the fairways just a little more than half the time (56.2%), ranking 182nd out of 205 qualified golfers. And Koepka is not alone. There are 18 players on the PGA Tour averaging over 310 yards per drive, and 73 are averaging over 300 yards. Just eight years ago, there was one golfer over 310 yards and 12 over 300 yards. Another golfer averaging over 310 yards per drive this season is Jon Rahm, a 23-year-old who many observers feel is a future major champion. He echoed Koepka’s thinking. The exception to the rule continues to be Jordan Spieth, a young golfer who does not hit it as long as many of the others in his cohort. 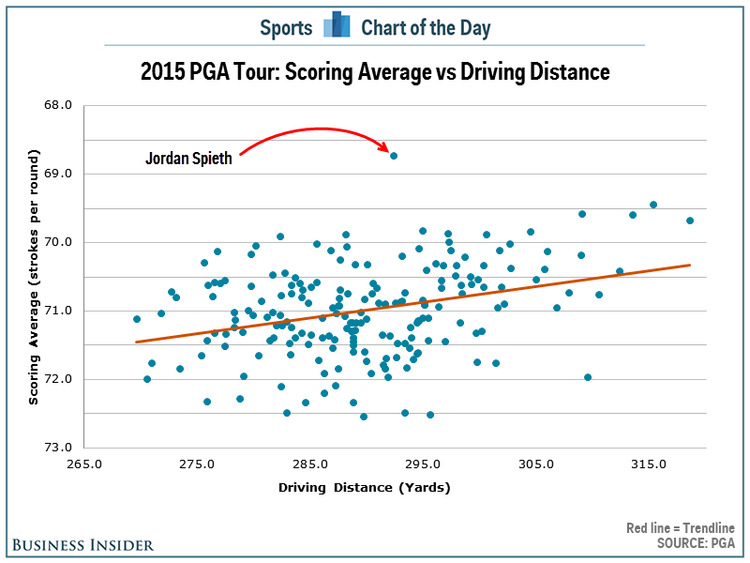 The chart below shows scoring average versus driving distance on the PGA Tour during the 2015 season, when Spieth won two majors and finished second and fourth in the other two. 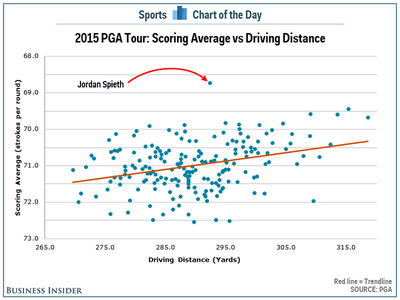 While Spieth is indeed as talented as they come, his game also has less room for error because his game is an outlier. Meanwhile, players like Koepka, Rahm, world No. 1 golfer Dustin Johnson, four-time major champion Rory McIlroy, and the up-and-coming Tony Finau are all bombing the ball off the tee and not caring too much about where it lands. For them, the game is mostly drive, pitch, and putt. Until tournaments start increasing the difficulty of the rough within 100 yards of the holes, the longest golfers will continue to dominate, and Koepka is likely to keep winning majors.